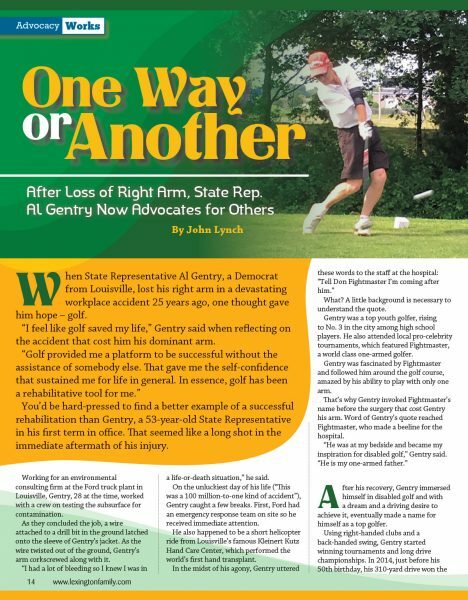 When State Representative Al Gentry, a Democrat from Louisville, lost his right arm in a devastating workplace accident 25 years ago, one thought gave him hope – golf. “I feel like golf saved my life,” Gentry said when reflecting on the accident that cost him his dominant arm. You’d be hard-pressed to find a better example of a successful rehabilitation than Gentry, a 53-year-old State Representative in his first term in office. That seemed like a long shot in the immediate aftermath of his injury. Working for an environmental consulting firm at the Ford truck plant in Louisville, Gentry, 28 at the time, worked with a crew on testing the subsurface for contamination. As they concluded the job, a wire attached to a drill bit in the ground latched onto the sleeve of Gentry’s jacket. As the wire twisted out of the ground, Gentry’s arm corkscrewed along with it. “I had a lot of bleeding so I knew I was in a life-or-death situation,” he said. What? A little background is necessary to understand the quote. Gentry was a top youth golfer, rising to No. 3 in the city among high school players. He also attended local pro-celebrity tournaments, which featured Fightmaster, a world class one-armed golfer. Gentry was fascinated by Fightmaster and followed him around the golf course, amazed by his ability to play with only one arm. That’s why Gentry invoked Fightmaster’s name before the surgery that cost Gentry his arm. Word of Gentry’s quote reached Fightmaster, who made a beeline for the hospital. “He was at my bedside and became my inspiration for disabled golf,” Gentry said. “He is my one-armed father.” After his recovery, Gentry immersed himself in disabled golf and with a dream and a driving desire to achieve it, eventually made a name for himself as a top golfer. Using right-handed clubs and a back-handed swing, Gentry started winning tournaments and long drive championships. In 2014, just before his 50th birthday, his 310-yard drive won the last of his long-drive titles. At 5-foot-11, 158 pounds, he still routinely hits the ball 260 yards o? the tee. In his first tournament after his accident, Gentry won a television set during a closest-to-the-pin competition. While accepting the gift, he broke down, realizing for the first time in his “new” life that he was going to make it. For Gentry, golf meant more than individual honors. The owner of his own real estate investment company, Gentry had time to dedicate himself to promoting amputee golf everywhere he went. “I have introduced golf to a lot of people with disabilities,” he said. In June 1994, Gentry founded the inaugural Kentucky Amputee Golf Tournament with 28 amputees from five states attending. It was later called the Amputee Players Championship, becoming one of the top events in the United States, annually drawing 70-80 of the nation’s best amputee golfers from the U.S. and Canada. The event is now run by Amputee Golf Charities in Shelbyville and will be hosting its 25th annual event in 2019. Gentry also is the founder of the North American One-Armed Golfer Association and served for six years as the organization’s first president. He is a past president of the Pleasure Valley Lions Club and helped create the Hand-for-Heroes program that teaches golf to permanently disabled service veterans. In 2011, Gentry received recognition from the Warrior Transition Battalion at Fort Bliss, Texas for his support in helping Wounded Warriors. Before the 2008 Ryder Cup in Louisville, he worked with his North American and European counterparts to launch the Fightmaster Cup, one-armed golf’s version of the Ryder Cup. The event was played at Cardinal Club in Simpsonville to coincide with the professional Ryder Cup. This year, Gentry and the North American team will travel to Deal, England for the latest installment of the Fightmaster Cup. Gentry is currently working to unite the nation’s various disabled golf organizations under one umbrella – the U.S. Adaptive Golf Alliance with the aim of getting adaptive golf into the Paralympic Summer Games. If all goes well, the sport will debut at the 2024 Games in Paris. Given Gentry’s exceptional organizational skills and ability to unite people, it’s not surprising that when State Representative Larry Clark, who had served in the House for 32 years, retired and sought a replacement for his 46th District seat, he looked to Gentry. When first approached, Gentry thought, “I’m not a politician.” Two meetings later, Clark convinced Gentry that he was the right guy for the job. Gentry’s campaign focused on education, the economy and jobs, but in the middle of his first term he had a revelation: “People with disabilities need a voice.” Who better to speak for them than Gentry, who immersed himself in the issues that people with disabilities face. “I educated myself on the landscape and tried to find out how I can help,” he said. For example, he currently is working on model legislation that would require all insurance policies to provide the minimum level of prosthetic and orthopedic care covered under the Medicare program. Moreover, getting people with disabilities into the work force has become job one for Gentry. “Government should help put people to work who are able to work, and provide assistance and care for people who can’t,” he said. He has been impressed with the impact people with disabilities have on a workplace and is encouraged that employers who have hired them have taken notice. Nobody fits that description better than Gentry himself. And he’s now in position to help others do the same. “We are facing workforce development challenges in the state and nation, and my message is, ‘Let’s not forget people with disabilities,’” he said. Just look at Al Gentry’s story.